Helen Elizabeth Carvlin (nee Reisdorf), 78, of Las Cruces, passed away March 4th, 2019, In Las Cruces, New Mexico. She was born on April 21st, 1940 to Anthony and Marian Reisdorf, in Java, New York. She spent her childhood in North Java, New York. Six months after graduating high school, she moved from rural New York to New York City, 300 miles away. She began her career as an assistant working for a firm on Wall Street, and met her husband, David. They moved to New Jersey, and after her husband passed, Helen relocated to final resting place in Las Cruces. She was a member of Las Cruces Senior Circle and St. Genevieve Catholic Church. She became a loved resident of the Heritage House of Las Cruces where she was cared for and became an integral part of their loving community of residents and staff. Helen is preceded in death by her parents, Anthony and Marian, husband, David, her brother, Anthony, and her brother-in-law, Stan. She is survived by her son, Michael, her daughter-in-law, Raquel, of Las Cruces, New Mexico, her daughter, Colleen, her son-in-law, David, of Hopatcong, New Jersey, and her grandchildren, Ben and Sadie Carvlin, of Las Cruces, New Mexico. She is also survived by her brother, Tom and family, of Batavia New York, her sister Kathleen and family, of Lakeview, New York, her brother John and family, of Estero, Florida, her sister Diane and family, of Fort Collins, Colorado, her sister Jane and family, of Farmington, New York, her sister Nancy and family, of Hendersonville, North Carolina, her sister Patricia and family, of Windsor, Colorado, and her sister Mary and family, of Attica New York. Helen was an avid traveler and visited many countries on various cruises as well as by plane. She also enjoyed Pilates, yoga, and other fitness-related activity at the Las Cruces Senior Circle where she met many good friends and was adored by many for her energy, enthusiasm and wit. Helen was a follower of Our Lord. Her friends and family take solace in knowing that she now walks with Him. Helen spent her final days comfortably resting at the Mesilla Valley Hospice. In Lieu of flowers or gifts her family suggests donating to the hospice. Services for Helen will be held at 11:00 am, Friday, March 15th, at St. Genevieve Catholic Church. A second memorial will also be held in July in New Jersey, date forthcoming. 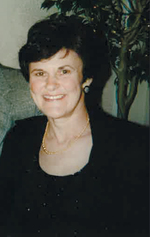 To send flowers to the family of Helen Carvlin (Reisdorf), please visit our Heartfelt Sympathies Store.